City of Owasso Utility Billing Supervisor Robyn Bynum with her husband Derriel and son, Brandon, City Finance Director Linda Jones, and City Manager Warren Lehr at Tuesday nights council meeting. 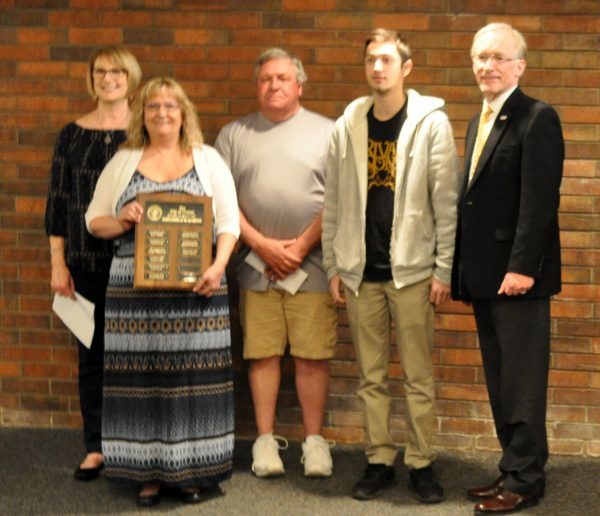 04/17/2019 – Robyn Bynum has been named the City of Owasso Employee of the Quarter. The award was given at Tuesday nights City Council meeting. Bynum has been the utility billing supervisor for the City’s Finance Department since November of 2006. Owasso City Manager Warren Lehr presented her with the plaque. Congratulation on a job well done.